Aldie's beginnings were laid in 1765 when James Mercer and George Mercer established a mill at the location of the present historic edifice. The location was a natural choice, as the gap contained the intersection of the Belhaven road between Winchester and Alexandria and the Mountain road which ran northwest to Snickers Gap. By 1809 the Little River Turnpike was completed from Alexandria to the Mercer Mill, replacing the older rutted section of Belhaven Road. With the opening of the road, James Mercer's son, Charles Fenton Mercer, in a partnership with William Cooke, set out to develop a village on 30 acres at the turnpike's western terminus. 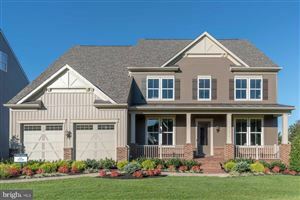 Mercer named the village for Castle Aldie, his Scottish clan's ancestral home. By 1811 a post office had been established in the village. Two years later, the Ashby's Gap Turnpike was completed from Aldie to Middleburg, and in 1818 the Snickersville Turnpike opened, replacing the Mountain Road. By the censusof 1820, Aldie had a population of 248 residents, making it the fourth largest town in the county. 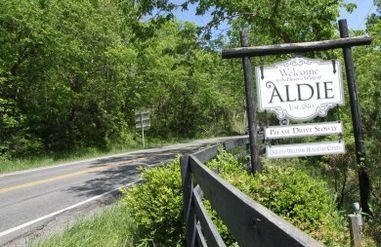 With the incorporation of Middleburg the following year, Aldie began a slow decline. During the American Civil War, the village itself and lands immediately to the west and northwest were the site of the Battle of Aldie during the Gettysburg Campaign. In addition, the Confederate partisanJohn Singleton Mosby was active in the village, and several small skirmishes between Union cavalry and his band of rangers took place in and around Aldie. Aldie's most famous resident was President James Monroe who constructed his private residence at Oak Hill (James Monroe House) in 1822. The Aldie Mill Historic District, Furr Farm, Loudoun Agricultural and Mechanical Institute and Mount Zion Old School Baptist Church are listed on the National Register of Historic Places.